UC Davis Chancellor Gary S. May has selected Prasant Mohapatra to serve as vice chancellor for research. 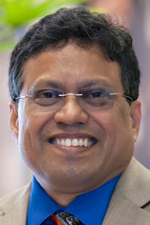 Mohapatra, who has been the dean of graduate studies and vice provost of graduate education since 2016, will oversee an annual research funding portfolio of about $783 million (as of fiscal year 2016), and lead the university’s corporate research relations and translation of UC Davis research into knowledge and technology of significant public benefit. Other leadership positions Mohapatra has held at UC Davis include associate chancellor (where he focused primarily on strategic planning for new initiatives and programs), interim vice provost and chief information officer, and chair of the computer science department. He held the first Tim Bucher Family Endowed Chair in the Department of Computer Science from 2009-2013, and has remained a professor in the computer science department. Mohapatra has led multiple large-scale collaborative projects. He was the lead researcher for the Multi-University Research Initiative, or MURI, from the Army Research Office, a $6.5 million, five-year award, which is composed of 13 principal investigators from seven other universities. He is the UC Davis lead researcher for the Collaborative Technology Alliance, or CTA, a $35.5 million award for 10 years from the Army Research Laboratory that involves interactions with about 40 members of the consortium and researchers from the Army Research Lab. Mohapatra is also the thrust leader for a Cybersecurity Research Alliance, or CRA, award, a 10-year award with a total grant of $48.2 million for five participating universities. In addition, Mohapatra led a National Science Foundation funded project for mentoring underrepresented undergraduate students. He is the principal investigator of an NSF grant for “Bridge to Doctorate,” an initiative to facilitate and train underrepresented minority groups to pursue doctorate studies in STEM areas. He has received funding from the Mellon Foundation to explore the transformation of the graduate admission process for the holistic evaluation to increase graduate student diversity. Currently, Mohapatra has seven patents and has published about 350 research papers and has been cited more than 10,000 times. He has received several best paper awards and has delivered distinguished lectures all over the world. He has graduated 33 doctoral degree students and 25 master’s degree students. Mohapatra is a fellow of the American Association for the Advancement of Science and an elected fellow of IEEE, the world largest professional organization dedicated to advancing technology. Mohapatra received his bachelor’s degree from National Institute of Technology (NIT), Rourkela, India, his master’s degree from the University of Rhode Island and his doctoral degree from Pennsylvania State University. He has received outstanding alumni awards from both NIT, Rourkela, and Pennsylvania State University. Mohapatra will assume his duties as vice chancellor for research on July 2. Hexter will be charging a committee to begin an internal search for Mohapatra’s successor in the fall. Associate Dean Jean-Pierre (JP) Delplanque will serve as acting vice provost and dean of graduate studies until a permanent selection is made.